A Remarkable Burgundian World Class Restaurant M. Jean Michel Lorain pours extraordinary energy, enthusiasm and talent La Côte Saint Jacques Restaurant to make it into one of the top restaurants in the world. He and his father before him has kept it there through two generations. Situated both on the main auto route from Paris to the south of France and on the much older waterway,the river Yonne, which before the age of the car, served for centuries as the transportation line from Burgundy to Paris, La Côte Saint Jacques, the family home of the Lorain family, has grown both in size and prestige. The talent of the father was inherited by the son Jean-Michel Lorain. He has taken the establishment to even greater heights. Today they boast 3 Michelin stars for which both father and son cantake credit. When we paid a visit to La Côte Saint Jacques in 2000, we were very much impressed. 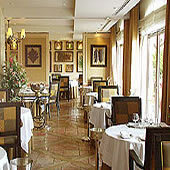 The food superb, the dining rooms calm and gracious. With the major addition in 2003, the Lorain family have finally created a well integrated hotel and restaurant complex with the public rooms, suites and dining facilities all on the same side of the road and right on the river for the view and the calm. 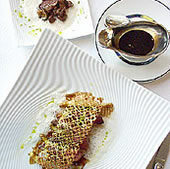 Like any fine chef, M. Lorain changes his menu seasonally and spurred by his creative juices. So suffice it to say that for all the meals we enjoyed in 2000 and 2003 we had nothing but the most delicious andperfectly prepared dishes. But this is a very personal thing - taste. The new kitchen complex that was built just over a decade ago featured separate kitchens for meat, for fish, for vegetables, for pastry, for chocolate and more. This gives the chef a measure of control not seen in most kitchens of even other high end chefs. 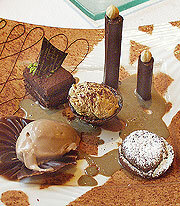 With the dedicated chocolate desert kitchen, his chocolate deserts are always to die for. Coffee is served, naturally, with another helping of chocolate goodies. The dessert had, of course, been preceded with several plates of other sweet confections. For up to date menus visit their web site menu page to see their current menu and start planning your trip! Don't forget that Jean-Michel also runs cooking classes in a specially built "stadium" school room on the river end of the subway. And do check out the goodies in their new "Le Boutique". 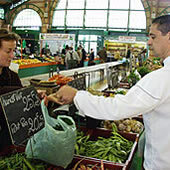 It is only a short walk down the street to the Joigny farmer's market where Jean-Michel shops several times a week for the kitchens. While the town of Joigny is not much of a destination, La Côte Saint Jacques most definitely is. If you plan to spend any time in Burgundy, La Côte Saint Jacques is a must. 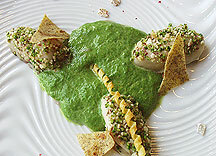 Not far from Auxerre and Chablis, it is within easy drive from Paris even just for lunch.